Within the nasal cavity, the turbinates or nasal conchae serve to direct the inspired air toward the olfactory epithelium in the upper posterior region. This area (only a few centimeters wide) contains more than 100 million olfactory receptor cells. These specialized epithelial cells give rise to the olfactory vesicles containing kinocilia, which serve as sites of stimulus transduction. Olfaction is less developed in humans than in other mammals, such as rodents. The receptor cells are actually bipolar neurons, each possessing a thin dendritic rod that contains specialized cilia extending from the olfactory vesicle and a long central process that forms the fila olfactoria. The cilia provide the transduction surface for odorous stimuli. The vomeronasal organ is a specialized bilateral membranous structure located in the base of the anterior nasal septum, at the junction of the septal cartilage and the bony septum. It is believed to detect external chemical signals called pheromones. These signals, which are not detected consciously as odors by the olfactory system, mediate human autonomic, psychological, and endocrine responses. The trigeminal nerve innervates the posterior nasal cavity to detect noxious stimuli. The small, unmyelinated axons of the olfactory receptor cells form the fine fibers of the first cranial nerve and travel centrally toward the ipsilateral olfactory bulb to make contact with the second-order neurons. Conduction velocities are extremely slow, and support is provided in bundles by a single Schwann cell. As previously mentioned, the trigeminal nerve (cranial nerve V) sends fibers to the olfactory epithelium to detect caustic chemicals, such as ammonia. The cribriform plate of the ethmoid bone, separated at the midline by the crista galli, contains multiple small foramina through which the olfactory nerve fibers, or fila olfactoria, traverse. Fracture of the cribriform plate in traumatic settings can disrupt these fine fibers and lead to olfactory dysfunction. Mitral cells are second-order neurons contacted by the olfactory nerve fibers at the glomerular layer of the bulb. The glomerular layer is the most superficial layer, consisting of mitral cell dendritic arborizations (glomeruli), olfactory nerve fibers, and periglomerular cells. Periglomerular cells contact multiple mitral cell dendrites within the glomeruli and provide lateral inhibition of neighboring glomeruli while allowing excitation of a specific mitral cell dendritic tree. Each mitral cell is contacted by at least 1000 olfactory nerve fibers. The external plexiform layer contains the passing dendrites of mitral cells and a few tufted cells, which are similar in size to mitral cells. Some of the granule cell dendrites in the plexiform layer contact mitral cell dendrites through a specialized dendrodendritic synapse, which also is termed a reciprocal synapse (vesicles seen within presynaptic and postsynaptic membranes). Tufted cells also receive granule cell input, through dendrodendritic and dendrosomatic contact. Pyramidal mitral cells are the largest neurons in the bulb and are located in a narrow band between the external and internal plexiform layers. The granule cell layer contains multiple small, round neurons that lack axons. Long dendritic processes of the neurons reach the more superficial layers and inhibit mitral cells and tufted cells. Small, distal processes make contact with the exiting mitral cell axons. Mitral cell axons project to the olfactory cortex via the olfactory tract. Medial fibers of the tract contact the anterior olfactory nucleus and the septal area. Some fibers project to the contralateral olfactory bulb via the anterior commissure. Lateral fibers contact third-order neurons in the primary olfactory cortex (prepyriform and entorhinal areas) directly. Third-order neurons send projections to the dorsomedial nucleus of the thalamus, the basal forebrain, and the limbic system. The thalamic connections are thought to serve as a conscious mechanism for odor perception, while the amygdala and the entorhinal area are limbic system components and may be involved in the affective components of olfaction. Investigations of regional cerebral blood flow have demonstrated a significant increase in the amygdaloid nucleus with the introduction of a highly aversive odorant stimulus, and this has been associated with subjective perceived aversiveness. The pyriform lobe includes the olfactory tract, the uncus, and the anterior part of the parahippocampal gyrus. The prepyriform and the periamygdaloid areas of the temporal lobe represent the primary olfactory cortex. The entorhinal area is known as the secondary olfactory cortex and is included in the pyriform lobe. 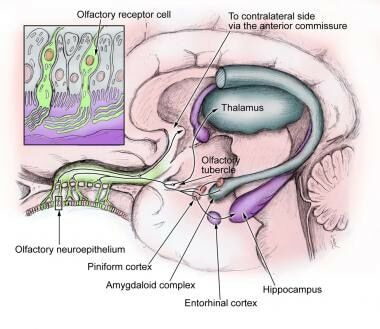 The olfactory system is the only sensory system that has direct cortical projections without a thalamic relay nucleus. The dorsomedial nucleus of the thalamus receives some olfactory fibers that ultimately reach the orbitofrontal cortex. The anterior olfactory nucleus receives collateral fibers from the olfactory tract and projects to the contralateral olfactory bulb and anterior olfactory nucleus via the anterior commissure. The region of anterior perforated substance contains cells that receive direct mitral cell collaterals and input from the anterior olfactory nucleus, amygdaloid nucleus, and temporal cortex. This area ultimately projects to the stria medullaris and the medial forebrain bundle. Using the uncinate fasciculus, the entorhinal area sends projections to the hippocampal formation, anterior insula, and frontal cortex. Olfactory dysfunction is a hallmark of certain syndromes, such as Kallmann syndrome (ie, hypogonadism with anosmia) and Foster Kennedy syndrome (ie, papilledema, unilateral anosmia, and optic atrophy usually associated with an olfactory groove meningioma). The classic description of partial complex epilepsy with a mesial temporal focus includes an aura of foul-smelling odors (termed uncinate fits) that occur before seizure onset, emphasizing presumed origination at the uncus. Head trauma leading to fracture of the cribriform plate may cause cerebrospinal fluid (CSF) rhinorrhea and a potential for meningitis. Paranasal sinus endoscopy may lead to violation of the cribriform plate and potential infectious complications. Olfactory structures also can be injured during craniotomies involving the anterior cranial base or from subarachnoid hemorrhage, which may disrupt the fine fibers of the olfactory nerve. Detection of olfactory dysfunction begins with sampling of a series of common odors, which can be performed at the bedside with odiferous substances such as coffee, lemon, and peppermint. Tests, including those developed at the Connecticut Chemosensory Clinical Research Center (CCCRC), have aided examiners in the identification of abnormalities in odor detection and discrimination. The University of Pennsylvania Smell Identification Test (UPSIT) is another useful tool; it consists of 40 items for evaluation of olfactory and trigeminal nerve function in the nasal cavity. Central hyposmia may manifest as abnormalities in odor recognition rather than odor detection. Thorough evaluation of patients who have anosmia includes imaging of anterior cranial structures. The clinician should always counsel patients with anosmia regarding sensory loss, including potential risks associated with the lack of smell sensation (eg, inability to detect dangers such as smoke, spoiled foods, toxins). Promptly complete evaluation and treatment of clear rhinorrhea in the patient in whom leakage of CSF is suspected. Initial testing of fluid for glucose suggests CSF but is not confirmatory. Presence of beta transferrin is a more sensitive indicator of CSF rhinorrhea. Computed tomography (CT) scanning with cisternography or radionuclide scans can be used to detect the site of CSF leakage from the anterior cranial fossa. Repair of leaks at the level of the cribriform plate may be achieved from the intracranial approach, intranasal (endoscopic) approach, or both, depending on the nature of the defect. Positron emission tomography (PET) scanning and functional magnetic resonance imaging (MRI) are promising modalities to assist in making the diagnosis of different types of hyposmia (central vs peripheral), as well as in delineation of the role of limbic structures as sites of odor recognition, memory, and integration of multisensory inputs. Díaz D, Gómez C, Muñoz-Castañeda R, Baltanás F, Alonso JR, Weruaga E. The olfactory system as a puzzle: playing with its pieces. Anat Rec (Hoboken). 2013 Sep. 296(9):1383-400. [Medline]. Morrison EE, Costanzo RM. Morphology of the human olfactory epithelium. J Comp Neurol. 1990 Jul 1. 297(1):1-13. [Medline]. Costanzo RM, Ward JD, Young HF. Olfaction and head injury. Serby M, Chobor K, eds. Science of Olfaction. New York, NY: Springer-Verlag; 1992. 546-558. Levy LM, Degnan AJ, Sethi I, Henkin RI. Anatomic olfactory structural abnormalities in congenital smell loss: magnetic resonance imaging evaluation of olfactory bulb, groove, sulcal, and hippocampal morphology. J Comput Assist Tomogr. 2013 Sep-Oct. 37(5):650-7. [Medline]. Wszolek ZK, Markopoulou K. Olfactory dysfunction in Parkinson's disease. Clin Neurosci. 1998. 5(2):94-101. [Medline]. Barnett R, Maruff P, Purcell R, et al. Impairment of olfactory identification in obsessive-compulsive disorder. Psychol Med. 1999 Sep. 29(5):1227-33. [Medline].